Two Novembers ago when @KhanyoMjamba published “10 of Africa’s longest serving presidents” in This Is Africa's African Identity, Yayah Jammeh was number 9 on the list. Like all the other men in Mjamba's lineup, Jammeh had ruled over his country for more than two decades after some bloody coup and revolution. Coups, revolutions, and power struggles are the focus of Ibrahim Whyte Sesay, a Sierra Leonean born writer based in the United States. In November 2016, Sesay published two books looking at fictional coups in Sierra Leone, as well as world wars in the east and west, up North, and down south. Below are excerpts from Whyte's comments in a recent chat with Vitabu. "After the CIA and the Belgians assassinated Patrice Lumumba (the first prime minister of the Democratic Republic of Congo) in 1961, a mere seven months after Congo became independent, has anything really changed? "African leaders know that they rule, not just by the domestic ballot and/or bullet, but also at the pleasure of the West. "If you take your marching orders from Washington, Paris or London and do as you are told, you stay in power, no matter how odious your rule is. Take a look at the hall of shame of African presidents, who had patrons at the Élysée Palace, Downing Street, and the White House: Bongos, Nguemas, Amins, Mussevenis, Bokassas, Mobutus etc. Some got dumped only after they became too crazy, even for their patrons. "Yayah Jammeh, the Gambian tyrant, was given full frontal support for 22 years, with all his bloodthirsty eccentricities, until he started acting “uppity” with talk of quitting the Commonwealth and the ICC. Then voila, he suffered the most improbable of election defeats. "The same goes for Samora Marcel (Mozambique) and Muammar Gaddafi. Gaddafi ruled Libya for forty-two years and he was tolerated, along with his all-female bodyguards, incoherent Green Book, and Lockerbie bombings. "But when, he started talking about a common African continental currency to challenge the dollar/euro fiscal hegemony, and acting like the paramount chief of Africa, they sent in warplanes and put a bullet in his head, like they did Lumumba, and left his rotting body to decompose malodorously in a container box for the whole world to see. At least Lumumba’s body was dissolved in a drum of acid. "Western political leaders may not say it, but it is the culture that pervades the inner sancta of power in the West. 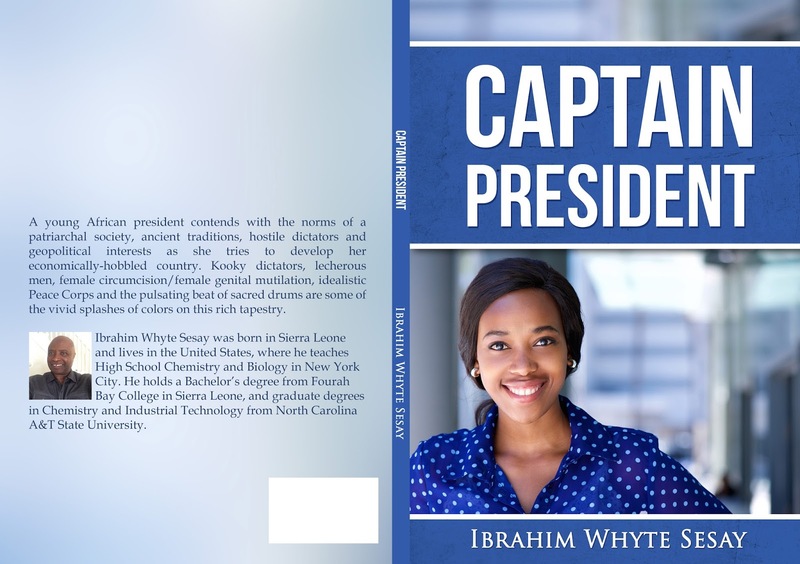 "In the book "Captain President" the president of Sierra Leone, Apollo Kamara, and his inner circle want a strategic partnership with the United States in the African franchise of the war on terror. They are particularly desirous of this because it brings with it a bonanza of millions of dollars; money that will be under their greedy, corrupt control. But there is a catch- the partnership will only be possible if there is an American-trained officer within the officer corps, who is conversant with the weapons systems that would pour into the country. It just happens that officer is Captain (then lieutenant) Doris Rogers. "The deal is about to go through with the president and his brothers, when Captain Rogers resigns, listing a litany of gripes-- her talents are underused, she is a target of sexual harassment. She has married rich to a scion of Silicon Valley during her training as an artillery officer, and wants to start a family and use her own money to run a charity for military families. As part of the effort by the Kamara Boys to get the American war-on-terror partnership, they make her head of training of the Salone Army and give her time, and the logistics, to do her charity work. "Captain Rogers claims that she came into money via marrying well in America. After she gets the presidential support to serve as the head of training in the army and do her charity work, she uses that money to buy goodwill among junior officers and non commissioned officers in the army. The Chief Justice swore her in as president of Sierra Leone, after she successfully executed the coup. "This follows the ignominious tradition of so many military putsches in Africa: You overthrow the government, you are now president. You assure the West that you will not mess with their business interests, and you are now Your Excellency and are given international legitimacy. Sad, but true."